This is the knotted top from Little Girls, Big Style in size 2. 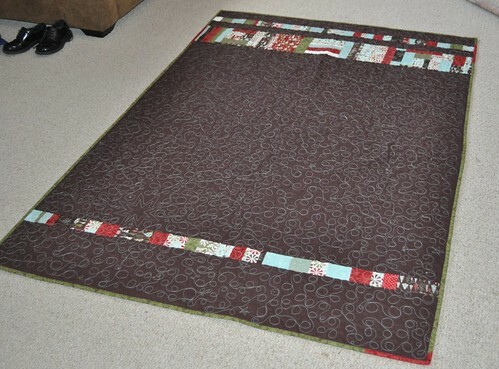 (affiliate link) I used a couple of the DS Quilts fabrics from JoAnn, and the dot fabrics were others I had on hand. 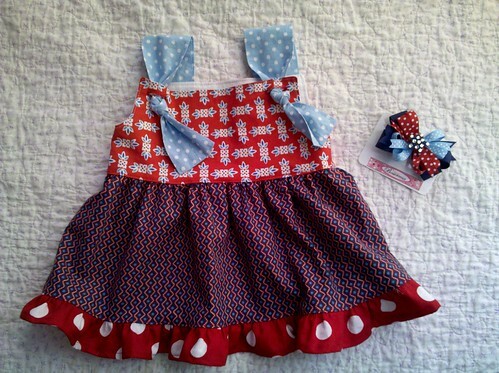 (The big red/white polka dot is from JA too, and I love it. The light blue is a mystery. I bought it in Utah a couple years ago but I don't have any other information on it.) I like this pattern; it turned out really cute, and if I make it again I will definitely make the shoulder straps significantly more narrow, or else make a pleat in them where they are attached to the bodice back. With the straps this wide, the back of the top doesn't lay really smoothly when my girl is wearing it, and making the straps narrower will look better in terms of scale on the smaller sizes. And, my friend Ceresa made the adorable bow this afternoon. She makes fabulous bows and sells them at her etsy shop, Bowreesa. The bow she made matches the top perfectly! 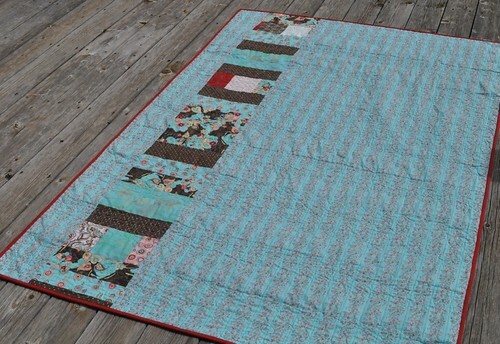 I got some new quilting thread yesterday and decided to start quilting my vintage sheet quilt. 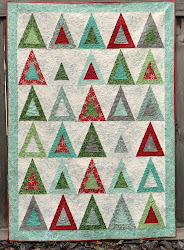 I am just going to do a little at a time (we have some busy weeks coming up here) and take a kind of sampler approach to the free motion quilting. 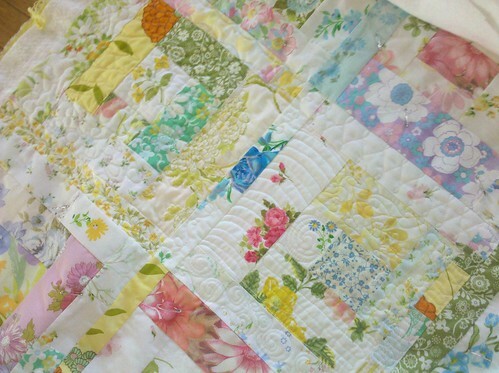 I will probably do some more quilting tomorrow; we'll see if I can make any changes in my approach that will solve my problem! Hope everyone's summer is going well! We are keeping busy here--my son had a birthday this last week and we had a fun but sort of basic birthday party for him. T-shirt decorating, pinata, presents, and homemade cookie cake. My sewing machine had to go to the shop for a little while but I actually got it back sooner than I expected and was able to do a little bit of sewing last week. It runs so nicely now and I found a new place that has the best sewing machine servicing prices in town! Anyway I wanted to thank everyone for their support of my Ruffle Crush quilt pattern. 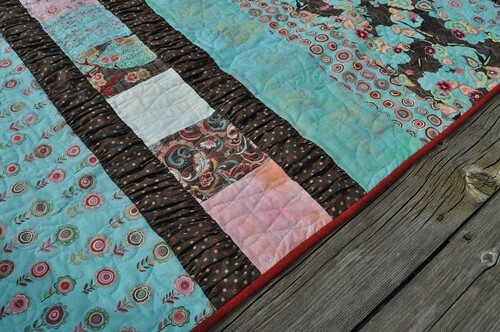 I have some photos to share from my testers, in case you wanted to see more examples of what this quilt can look like. 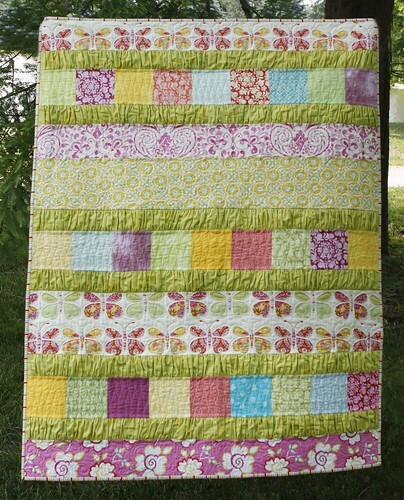 Molly blogs at Stitch-N-Thyme Designs and she blogged about this quilt for the Blogger's Quilt Festival back in May. 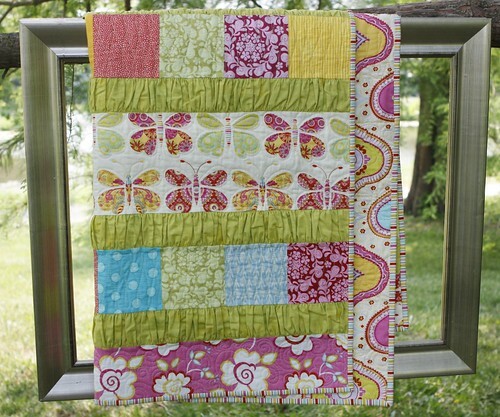 I'm so happy to finally be launching my Ruffle Crush quilt pattern! 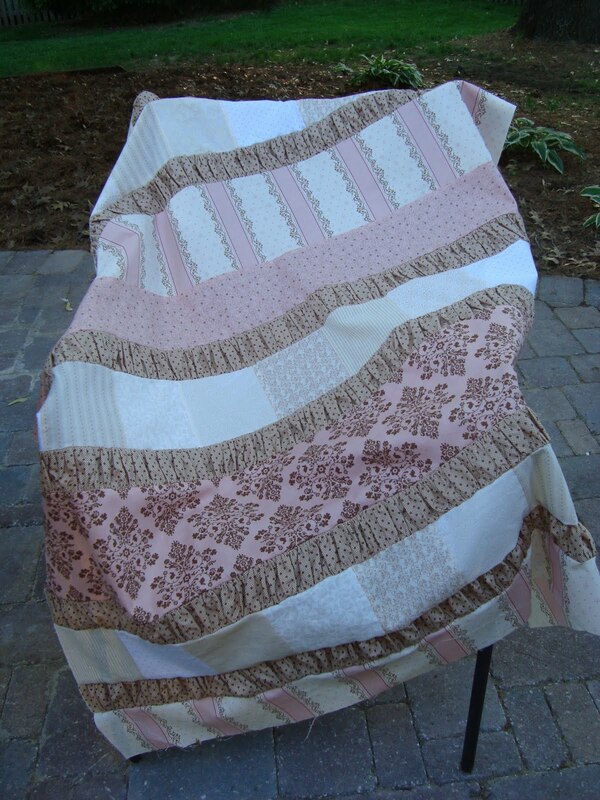 The PDF pattern is available to purchase at my Craftsy shop here. (There's also a link to the shop in my blog sidebar.) It is an instant download and will be emailed to buyers as soon as payment is finalized. 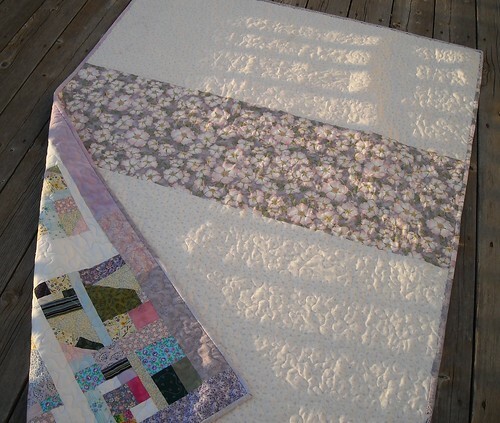 Making this pattern has been a long process for me, and I want to share a little bit about the quilt--I made the first Ruffle Crush quilt last year for my sweet sister-in-law Amy T., using Moda's Blush fabrics by Basic Grey. 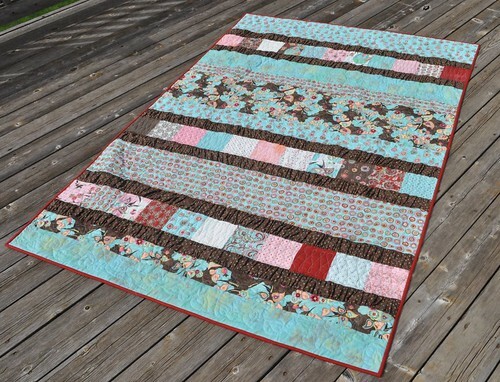 The ruffle strips in this quilt are Moda Grunge in the color "Decadent," and the charm squares came from my stash. All other fabrics are from the Kumari Garden line. 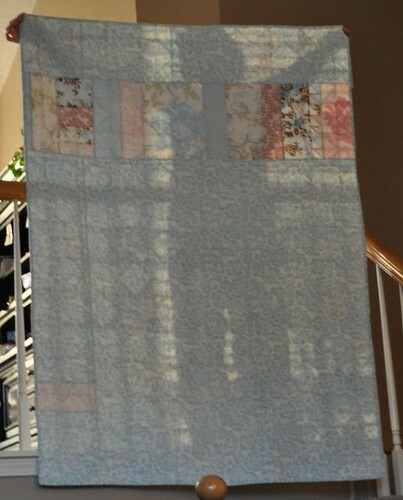 This quilt is about 40" x 53". 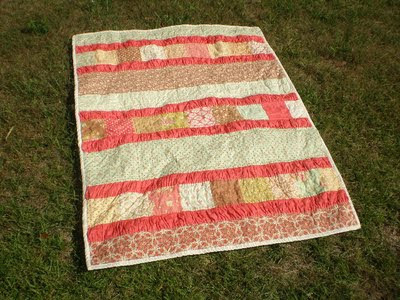 *It's available in my shop and is on sale for $8.50 until June 27, 2011 (next Monday). After that the price will be $10. 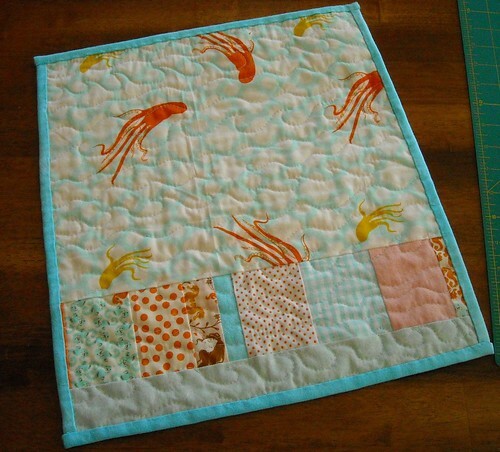 *The pattern includes directions for two sizes—baby quilt (40” x 53”) and throw quilt (50” x 70”). *This pattern is a 27-page PDF file that includes lots of photos, cutting and layout diagrams, and two suggested backing options for the larger quilt size. *Three tutorials are included with the pattern—Detailed Gathering Instructions, Straightening Fabric Edges, and Matching Large Scale Prints. 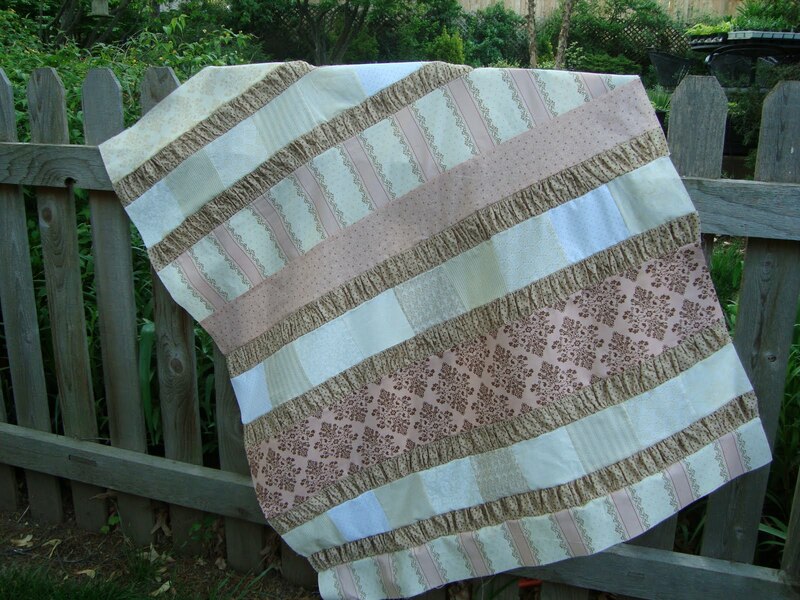 The fabric requirements for both sizes of the quilt are available in the pattern description over at the shop. 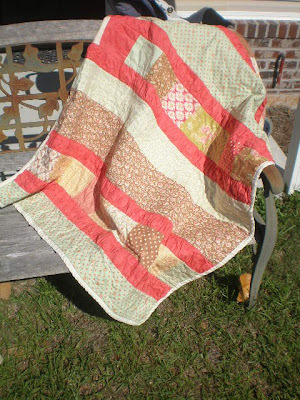 Finally I'd like to thank Katrina Coleman, who took the photographs of the Kumari Garden Ruffle Crush quilt. She is a local friend who's just getting her photography business started and I will let you all know as soon as her website is ready! 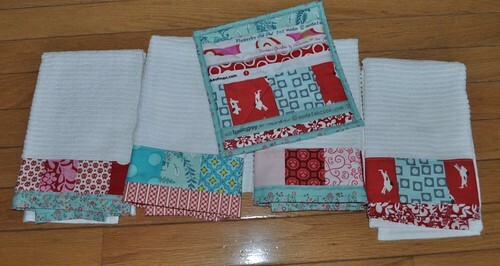 A cute potholder and 4 kitchen towels with pieced fabric strips along one edge. 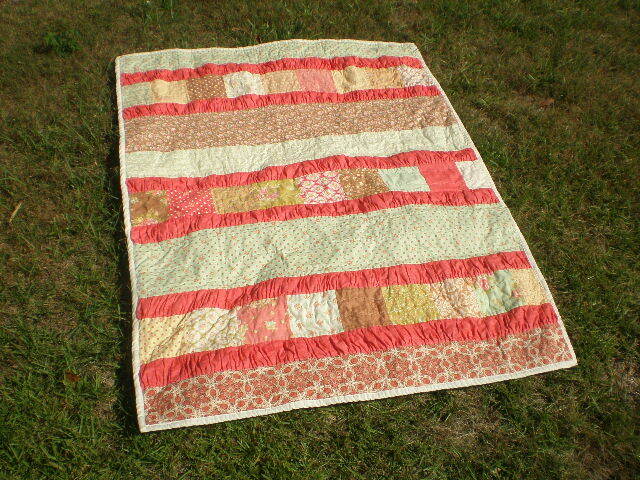 I love it, and I can really use new kitchen towels! 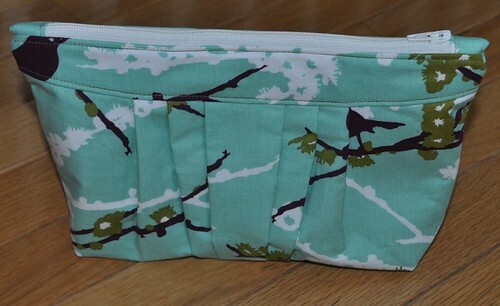 I love this fabric and this is a great little bag! Finally, some fabric. 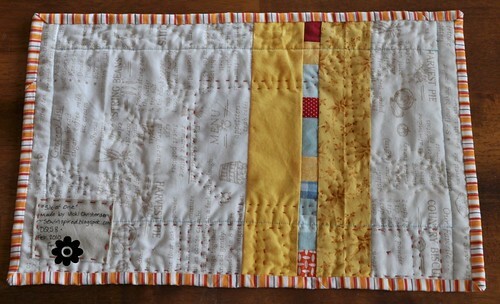 Our meeting this month was sponsored by Tammy of Marmalade Fabrics. She had a lot of great fabrics but I just bought one thing. 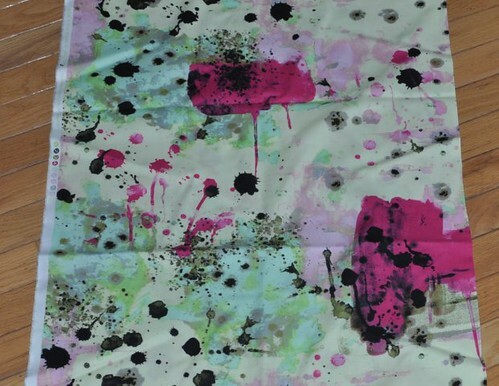 1 yard of the paint splatter fabric by Jay McCarroll. I am thinking a large tote bag... we'll see what I end up doing though. 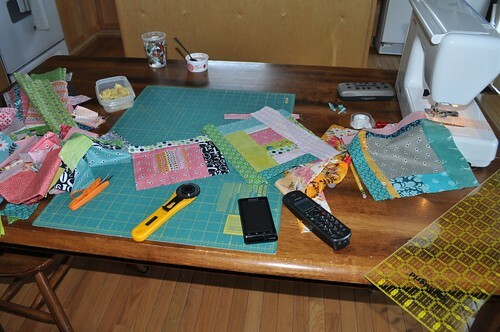 I had to take my sewing machine into the shop yesterday due to excessive squeaking and clunking noises, and my backup machine is broken too, so I have a bit of time to get organized and plan out what I want to make next when my sewing machine gets back. 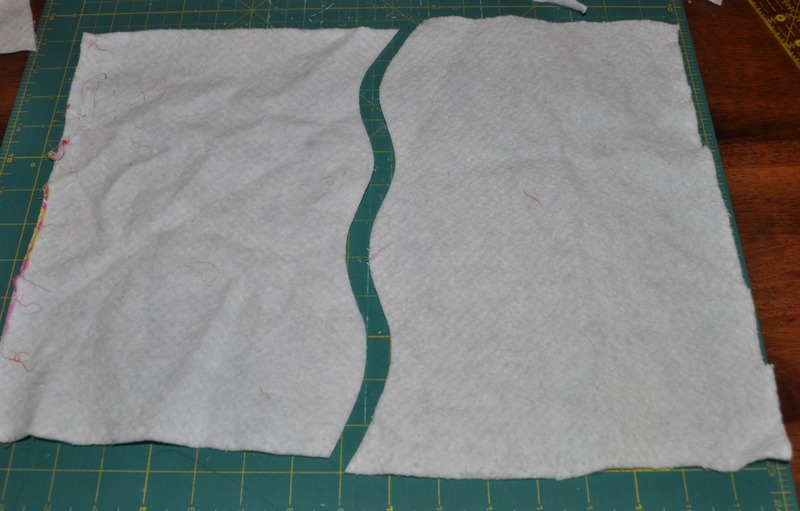 I might even do some hand sewing. 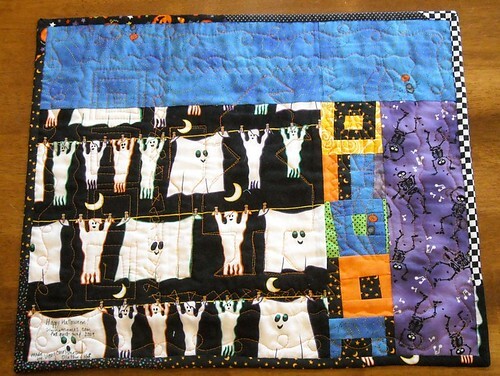 Rebecca at Chasing Cottons has a new post up about creative, interesting quilt backs, and I decided to show and tell some of the backs of my quilts. 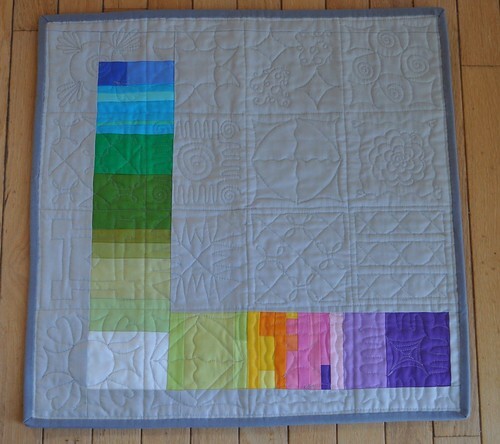 Do you have any interesting quilt backs to share? There's a link-up at Chasing Cottons... I'm going to go check it out! *Totally giving up on a bedtime routine for them, sigh. 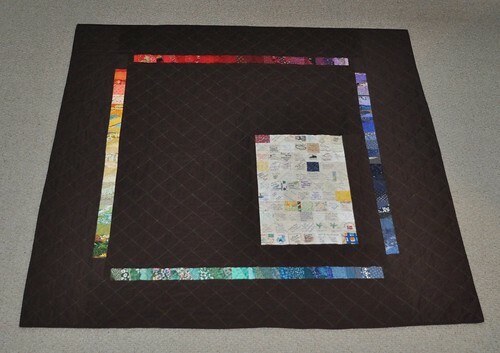 I did want to share about the KCMQG pouch project; it is a difficult thing to write about but our guild has been making fetal demise pouches to be used at St. Luke's Hospital in Kansas City. That's where my preemie girl was born so of course I had to join in. I've made a couple and have a few more kits to make up today before our guild meeting. Do visit the Kansas City MQG blog to find out more about the project, ok? Also I got this sweet book in the mail the other day; I was lucky to win it from Ayumi at Pink Penguin during giveaway week. Thanks Ayumi! 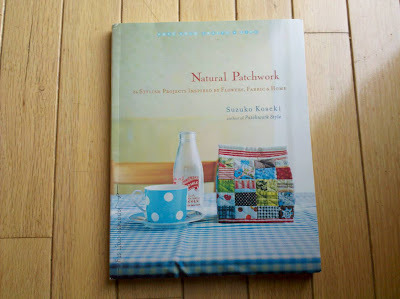 I've just flipped through it so far but it has some interesting projects that I think I'll try for sure. My boys want to help make a German pancake this morning, so yummy. I need to decide if I'm going to wake them up now or wait a little longer. Hope you have a great day! Hi friends! 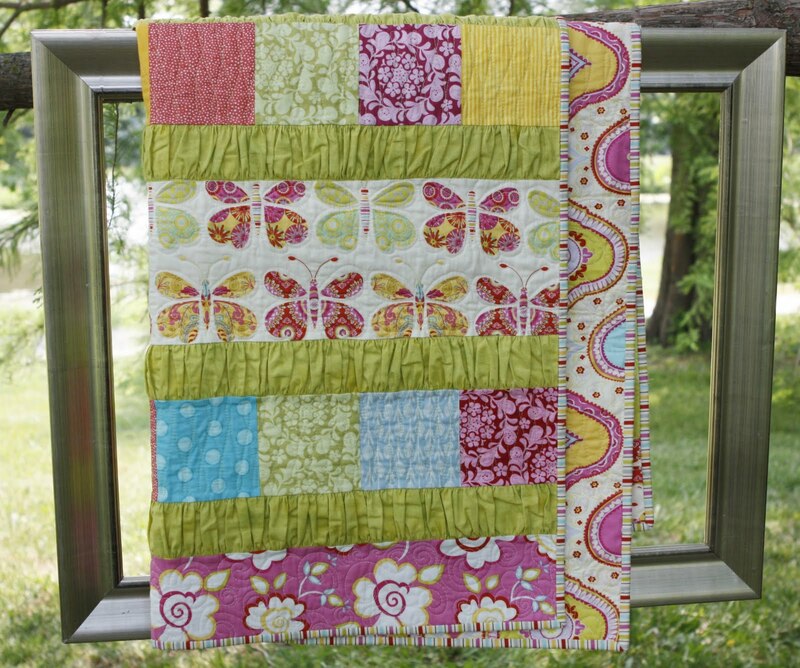 Just wanted to let you know I have a quick little tutorial on how to machine piece batting into larger pieces... over at Chasing Cottons where Rebecca has been hosting Quilt Class 101 over the last several weeks. Thanks so much to Rebecca for letting me join in! 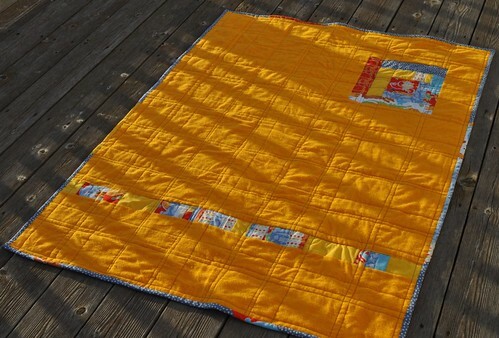 Today, I finished up the last 3 blocks for my (this quilt needs a name!) 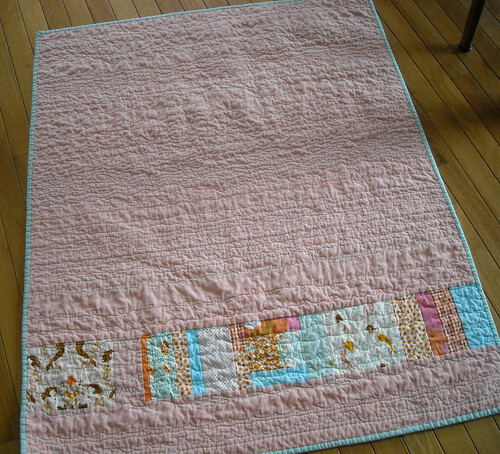 king size quilt, for the naked bed challenge. I took some pictures along the way. 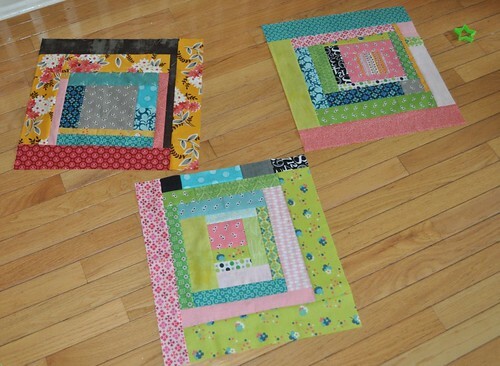 I ended up taking apart a couple of my earliest blocks and redoing them; they didn't have the same feel/look as what I ended up doing later, and I do like them better after the second try. The deadline for the challenge was extended until Monday, so I don't have to try to finish this thing by tomorrow. 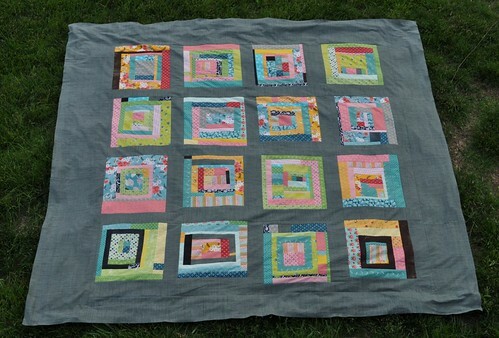 I did get started with the sashing though, and the first row is assembled. 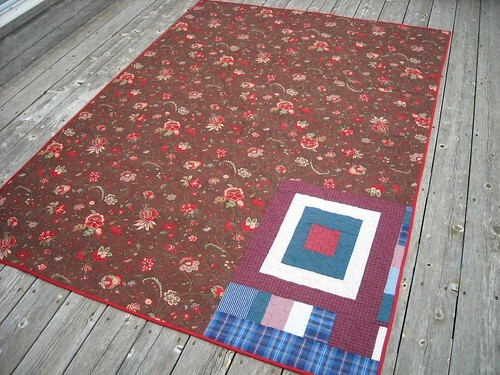 My leftover fabric and scraps are all straightened up, too. In regular life news, we are starting off the summer busy! We went to the pool yesterday, and the library today. We have a ton of new books from the library and I plan to take the kids weekly. I also got the boys signed up for swimming lessons but I was too late to get them into the first session. Tomorrow we have an orthodontist get-measured appointment and I think Friday will be another pool day, if the weather cooperates!